I really liked this book because Roslyn wanted to see a penguin on the other side of the world. One of my favourite parts was when Roslyn woke up the mole. Other people who would like this book are my Mommy, Nana, Papa, Daddy and my cousin Kate. Review by Jesslyn, age 9, grade 4. Editor’s Note: Marie-Louise Gay is a well known and popular children’s author known for her whimsical and humourous books. 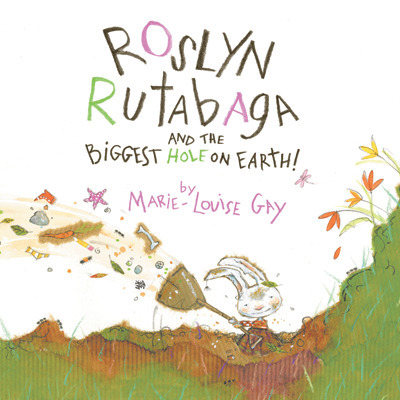 Marie-Louise’s illustrations of Roslyn (a determined young rabbit who hopped out of bed one morning with a plan to dig the biggest hole on Earth before lunch) are a delight! Expressive and full of detail (a grumpy worm, a grouchy mole and a dog try to block her progress), the pictures in this irresistible little book earned Marie-Louise the Amelia Frances Howard-Gibbon Award for Illustration. This review is from Canadian Teacher Magazine’s Mar/Apr 2013 issue.